After a year marked by divisiveness & rancor, Larry invites a panel to discuss how to feel better in 2017: the benefits of unplugging from the news; the free exercise proven to diminish depression and anxiety; & finding peace in the face of tumult. After a tumultuous 2016, Larry King starts off the new year with a search for happiness, and how to find it in a world with so much distress. 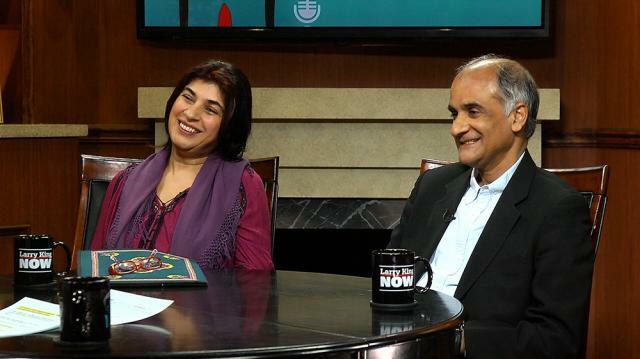 He is joined by two experts on the subject: spiritualist and author Mitra Rahbar, and journalist and renowned speaker Pico Iyer. The three discuss the definition of happiness, and its relationship with other strong emotions like fear and joy. Then, the three examine political divisiveness and labels, and how quickly we resort to sorting others into categories. Mitra Rahbar speaks to the beneficial effects of meditation, and how differently it is practiced amongst cultures and individuals. Then, Pico Iyer addresses the aversions people have to practicing meditation, despite the known health benefits. Later, Larry King and his guests turn their attention to the many external sources of happiness that people seek, including money and their smartphones. Iyer points out the flaws in this logic, and believes that we are in a world with increasingly more data and knowledge and increasingly less wisdom. Finally, both of Larry’s guests speak to tragedy and how those events shaped their lives.